﻿ Cloud Payroll Solution | Payroll Software and payroll services online – Accord eHR. Anywhere Anytime payroll managment with access to the hosted payroll software on our cloud servers. Comprehensive and easy to use payroll solution with complete employee informtion with various salary heads like allowance, deductions, benefits and compliances. Track vacations, manage shift, rosters, absense and leave with the web interface for time & attandance management that is part of the Intelliob Payroll on cloud. Business Managers can Monitor employee attendance online for reconciliation and track overtime deatils. Option to manage various Time policy like Fixed Time, Flexible Time and Contract Time are part of the solution. Compute payroll tax based on prevalent taxation laws. You no longer need to worry about the implications of ever-changing taxation rules. It is our responsibility to ensure compliance with the applicable laws. PayCare Payroll on Cloud is an alternative cost effective delivery model of payroll services online in India. The payroll Software and employee self service portal is hosted on our infrasture. The customer's payroll manager has secure online access to the hosted payroll solution for payroll processing and managing of organizations payroll managment needs. All organization members have have access to the Employees self serviec portal. (ESS). PayCare Cloud Payroll or Web Payroll is comprehensive online payroll system with simple user interface for standard as well as complex payroll managment with various policies managment pages for leaves time sheets and pay options. This also includes complete employee tax and statutory and payroll reports online. Online Cloud Payroll with employee Self Service Portal. Improve profitability and deliver other economic and organizational objectives. 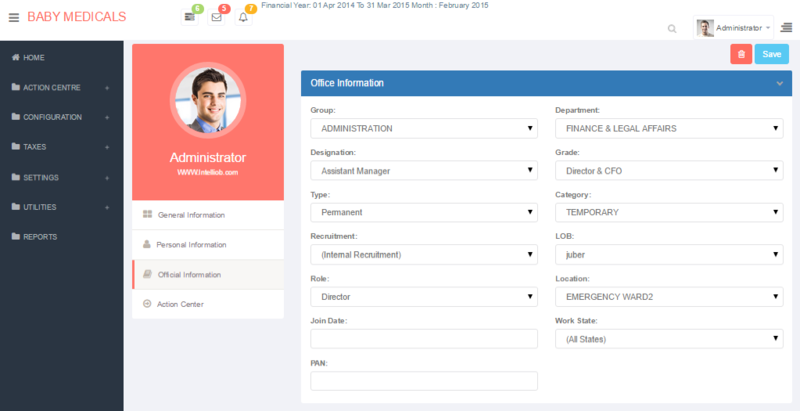 Manage Payroll and benefits administration online with anytime and anywhere access to HR Portal and Employee Self Service access for authorised personals.